The 72 Angels teachings have their origin in the Middle Age (XI-XII centuries) in the school of practical Kabbalah founded by the French Isaac the Blind (1160-1235). 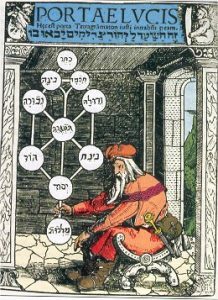 He believed that individual beings in the world were manifestations of the 10 Sephirot of the Tree of Life on a lower level of reality and that the purpose of the spiritual work was to re-ascend the 4 levels of emanation in order to unite to the Divine Thought. According to this school all individuals had the right to personally recall and manifest the Divine in their daily life and the work with the 72 Angels was a tool that could offer them that possibility. 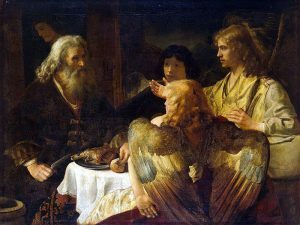 The 72 Angels names come from 72 letters that compose each of the three verses of the Exodus (14:19-21), called Shemot – which means Names – in the Bible. This chapter, which describes the exodus of the Hebrew people from Egypt to the promised land of Israel through the Red Sea, is symbolic of the human journey from the materialistic and dualistic view of life to a state of oneness with the Divine. Each of them represents a quality of the Divine that we have come here to work with and manifest in our life so that we may come to an understanding of who we are and discover our true identity in order to consciously become co-creators with the Creator. They represent a way to the opening of the heart and they offer us the possibility to become aware of our individual role in the Greater Plan. The Angels are step-down transformers and amplifiers of the Divine Light and their purpose is to help us become what we are meant to be by increasing our “image and likeness” to the Divine qualities that we are made of. The meaning and the numerological value of the three Hebrew letters each name is composed of, describe the qualities that each Angels vehicles. Each letter depicts the inner work of rising in consciousness that we have to do and it offers us an answer to the HOW this may be achieved. According to this Kabbalistic tradition, each Angelic energy is an expression of the three Rays of Aspect as emanations or forces that exhibit a specific quality of the Divine Trinity: the First Ray of Will and Power, the Second Ray of Love/Wisdom and the Third Ray of Active Intelligence. These 72 Angelic forces are all part of our human nature, but each of us has three specific correspondences according to our date of birth and time. The Incarnational Angel is associated to Ray 1 and it offers us a description of the Will and Power that brought us into being; it relates to our mission and purpose in this life and the Divine quality that we have come here to incarnate and manifest. The Heart Angel carries the energy of Ray 2 and it gives a portrayal of the way we relate to our emotional aspect, our emotional challenges; it teaches us what we need to work with in order to overcome the inner emotional conflict and open ourselves to unconditional Love. The Intellectual Angel relates to Ray 3 and it contributes to the way we think about ourselves and our daily life; it supports us in transforming our conditioned patterns so that our mind may become a mirror of the mind of God. The Angels activate an alchemical change within us. The work of the Angels reveals the Will of the Soul, and the Will of the Soul is a reflection of the Divine Will. When our Angels are with us, we do not hear the rustle of wings nor feel the touch of their feathers, but we know and become aware of their presence by the deep and pure Love that they evoke in our hearts. 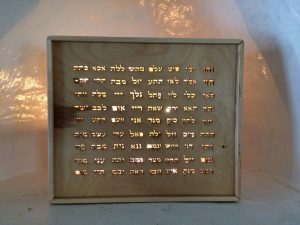 The word Kabbalah means “to receive” and the practical work with the Angelic energies requires the willingness and openness of each of us to be open to receive and working daily with these Divine qualities by inviting them to dwell in the temple of your body on the three different levels (Physical, emotional and mental) so that they may help us rise in consciousness. For an individual consultation or information about the Angel/Alchemy courses, please fill up the form below.